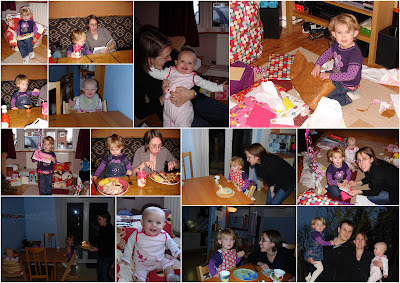 ThingOne had her birthday today, having already had a 'special' day (as she called it) on Saturday with her party. She seemed to have a really good time, though things were a little fraught occasionally this afternoon, and I think she'll have a bit of a comedown on Monday. Overall though, she's been a star this weekend. We got her a set of Dr Seuss books (I really like reading these to her, and she enjoys them almost as much) and a bean bag arm chair. She didn't seem that bothered by the chair. Shame - I thought she might really like it. Well, she may come around to it. We did some craft this morning which somehow involved me doing most of the craft. We ended up sticking a mosaic of a 'magic tree' to the wall which was almost entirely done by me. It was basically me doing some substandard cutting and sticking and putting my own artwork on our wall. It makes me look a bit simple. I'll lie to visitors and tell them ThingOne did it. This afternoon ThingOne had another birthday cake, since she wanted to blow out more candles. She'd had one yesterday at the party but apparently that didn't count as three children blew those candles out. We went to Nandos for tea. ThingOne thinks this is a proper restaurant, and loves the Frozen Yoghurt the most. ThingTwo tried to steal the show by making her first proper word-like noises. It was pretty close to Da Da. That's my story and I'm sticking to it. At one point she said something like "Ha Pa Ber Da" so we told ThingOne that ThingTwo was trying to wish her a happy birthday. It did sound eerily close, so we were partly convinced ourselves. We really tried to do ThingOne's hair to make her look smart today, but she's at the Boris Johnson stage of her hair growth cycle. It will need cutting very soon. I've trained her to go around telling people her hair makes her look like Boris Johnson. She'll thank me for that in years to come. So happy birthday to you, ThingOne (as I seem to have been made to sing a hundred times today). You're turning into an amazing little girl who's tonnes of fun to bring up, and it's going to be fun to see what you're doing after another year.